I am so bothered with how it's skewing! I haven't seen that on anyone else's and certainly not on my main inspiration… so I'm thinking it must be me. Any thoughts on what I could be doing wrong, experienced crocheters I don't think this is a blocking fix either… I can't see how that could fix it. Just look at the dark brown to the blue… something's off! I really tried to look past the skew and tried to focus on how beautiful it is but I just can't!! ahhhh!!! help! Not sure what might be causing the skewing; however, it makes it look very Denyse Schhmidt-like. I think you did an extra block (extra three double chains) in a space. I’d look carefully at each chain space were it starts skewing. That’s what would cause this. The colors are great by the way. I think it looks amazing with the skew! When I first saw the picture I thought you were doing it on purpose. I agree – the skew looks totally cool! I experienced the same with my blanket, and had comments from others who had too, so it is not only you! I don’t crochet, so I have no idea what went “wrong,” but once this lovely blankie is finished, when will it EVER be seen all laid out flat on the floor and studied from a bird’s eye view? Once someone is all curled up and cozy under that pretty Koigu, the skew won’t even matter. I’ve heard that turning direction at each new round eliminates the skewed effect. Here’s an explanation (plus, this makes them reversible! 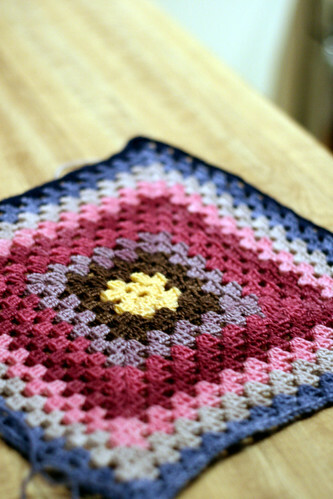 ): http://www.crochetcabana.com/tutorials/granny_square_reversible.htm. awesome link! thank you. and thank you everyone for helping me figure it out! ive since pulled and shifted some rounds and its not as dramatic anymore! yea! in the second picture of your post before this one you can clearly see the distortion starting in the lower corner in the pink. There are not enough chains at thecorner, maybe only one, maybe more. This way it pulls to one side.I think it happened a few times more OR you have the right amount of chains but make them tighter than your other stitches, this happens to many crocheters at corners of grannyblocks. You count and the numbers are good, yet the block pulls. 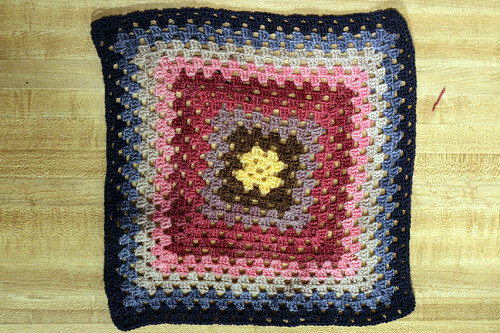 Do not change the direction you crochet (I mean do not turn over your block to change direction) or you will have richt and wrong side rounds, like putting a doily with the wrong side up an the table. The right side of crochet looks like the right side of stockinet knitting: smooth and elegant, not nobbly. I hope you will try out if you make yourstitches tighter at corners, because if this is the problem it is so simple to avoid in future. I have been crocheting and knitting and sewing for more than 54 years and I still learn tips and tricks from Internet weekly. I rather like the skew. I’m afraid fixing it will require drastic action. The reason your granny square afghan looks skewed is that it was crocheted on the same side. To prevent this skewing, you must turn your work every round. That is just the nature of the beast.